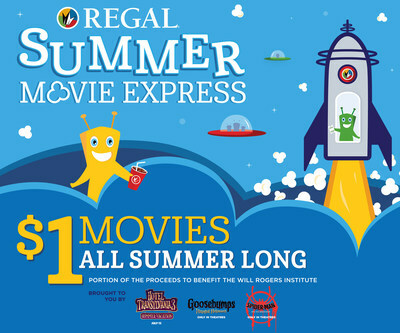 KNOXVILLE, Tenn., May 17, 2018 /PRNewswire/ -- Regal, a leading motion picture exhibitor operating one of the largest theatre circuits in the United States, announces the return of its family-favorite program, the Summer Movie Express. This kid-friendly film festival is a nonstop adventure, and the perfect getaway for movie lovers. The Summer Movie Express features $1 family movies on Tuesdays and Wednesdays at 10:00 am, with a portion of proceeds benefitting charity. "For just $1, moviegoers of all ages are invited to climb aboard the Summer Movie Express for unbeatable entertainment throughout the summer where they can see great movies like Despicable Me 2, Sing, The Secret Life of Pets and more," said Ken Thewes, Chief Marketing Officer at Regal. "What better way to be entertained and spend quality time with each other than at your local Regal Cinemas."